Botched sterilisations in Chhattisgarh leave 11 women dead | Mukti Trust | Sponsor a girl today! An Indian surgeon used infected instruments to sterilise 83 women in about six hours, according to a local medical official, leaving 11 of them dead and another 68 hospitalised in the central state of Chhattisgarh. The doctor breached guidelines that limit surgeons from performing more than 30 sterilisations a day, said the official, who asked not to be named because details of the investigation are private. He also failed to disinfect the instruments before using them again, the official said. Women often suffer most from efforts to control population growth, such as one-day sterilisation drives, in the nation of 1.2 billion people. India has the world’s third-highest female sterilisation rate after the Dominican Republic and Puerto Rico among more than 180 countries tracked by the United Nations. “Chhattisgarh was a culmination of no accountability in the system and when basic hygiene conditions aren’t met,” Kerry McBroom, director of the Reproductive Rights Initiative at the New Delhi-based Human Rights Law Network, said by phone. “The most appalling and terrifying thing is that it’s so commonplace in India for women to suffer these surgeries” under poor conditions, she said. Eleven women have already died, and several remain in a critical condition after operations conducted on November 8th, according to Amar Singh Thakur, chief health officer for Bilaspur district. Prime Minister Narendra Modi asked Chhattisgarh’s leader to ensure a “thorough investigation and action” on the “unfortunate tragedy,” his office posted on Twitter. Sterilisations are voluntary and couples choose between a tubectomy or vasectomy, Harsh Vardhan, who was India’s health minister at the time, told parliament on July 18. From April 2010 to March 2013, the government paid about 510 million rupees ($8 million) for 15,264 deaths or failed surgeries, he said. “If they follow the guidelines, then sterilisation is a very safe method of contraception and population control,” Banerjee said. India’s National Health Family Survey in 2005 to 2006 showed that about 37 per cent of married women have been sterilised while only 1 per cent of men have had a vasectomy. About 29 per cent of Chinese women surveyed around the same time had been sterilised compared with 4.5 per cent of men, according to UN data. The vasectomy rate compares with about 24 per cent in Canada and 11 per cent in the U.S.
India in 1952 was the first country to start a family planning programme. Emergency rule in the 1970s allowed then-Prime Minister Indira Gandhi to forcibly sterilise people, according to the Population Research Institute. About 47 per cent of women in the survey aged between 20 to 24 said they were already married by the legal age of 18, while 16 pe rcent of 15-to-19 year-olds were mothers or pregnant when the survey was being conducted. 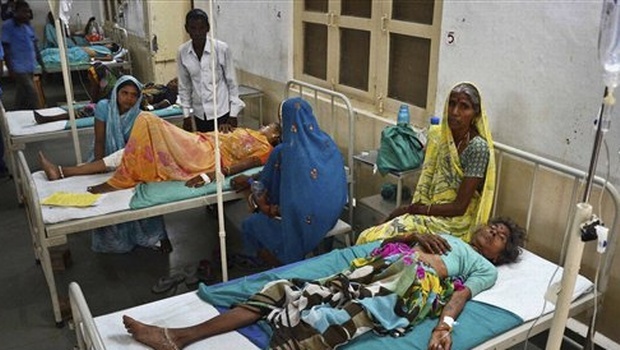 No Comments to "Botched sterilisations in Chhattisgarh leave 11 women dead"